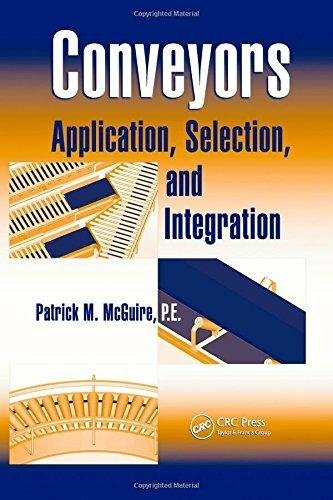 Put simply, this is probably the first book in 40 years to comprehensively discuss conveyors, a topic that seems mundane until the need arises to move material from point A to point B without manual intervention. Conveyors: Application, Selection, and Integration gives industrial designers, engineers, and operations managers key information they must consider to determine which type of conveyor to purchase and how to optimally integrate it into their system to meet their transport needs. Tapping into his more than 20 years of experience in the materials handling industry, the author discusses requirements for specific products or materials and environmental factors, covering operation in extreme temperatures. Each chapter details a specific type of conveyor including chain, belt, and gravity varieties and highlights its primary features, such as load capacity and rate, and operation. The text also addresses costs and objectives of material handling, exploring rate calculations, controls systems, and other relevant aspects. It includes photographs of actual installations and a glossary of key terms. Unless you have conveyor experience, you ll need help deciding on the best mode of transportation for your product. This volume stands apart as an aid in this decision process because it does not take a myopic view of one specific type of conveyor. Rather than solely covering bulk material handling or screw conveyors, it analyzes all of the major varieties of conveyors. This book is not meant to be an engineering manual for designing conveyors, but rather a broader guide to integrating conveyors in a transportation system.